In April 1963, Swedish researchers Carl-Bertil Laurell and Sten Eriksson published their landmark research on the discovery of Alpha-1 Antitrypsin Deficiency. 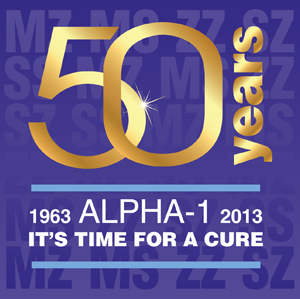 To commemorate the 50th anniversary of the discovery, the 4th International Alpha-1 Patient Congress and an international Research Conference on Alpha-1 Antitrypsin will be held in Barcelona, Spain, April 11-13, 2013. Alphas from all over the world are welcome to attend the Congress, and Alpha-1 patient associations from many countries are expected to send delegates to the Congress April 12-13. The Research Conference will be held April 11-12, and there will be a joint session of patients and scientists on the afternoon of Friday, April 12. Anyone registered for the Patient Congress may also observe the Research Conference sessions free of charge. For complete information on the Patient Congress and to register, see http://alpha-1barcelona2013.org. For more 50th anniversary/community events, visit our Calendar of Events.